In contrast to conventional, sterile appearing medical offices and surgery centers, thanks to the artistic talent of photographer/designer Tiffany Nelson, Newport Skin Cancer radiates warmth and serenity without compromising attention to the highest standards of medical and surgical care. Below describes some of the reasons why this is possible. The Centers for Medicare & Medicaid Services (CMS) regulates all human laboratory tests in the U.S. through the Clinical Laboratory Improvement Amendments (CLIA). 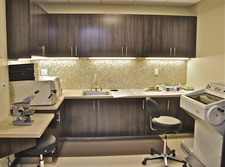 Within our Newport Skin Cancer location is a dedicated, CLIA certified laboratory space specifically for the processing and meticulous evaluation of Mohs surgical specimens. A full time Mohs technician is employed and a permanent, on site specimen processing laboratory is available for use by Drs. Rotunda and Bickle, the Laboratory Director, at all times. Patient’s may become tired and a bit frustrated by the “back and forth” most commonly experienced during a typical Mohs surgery (ie., walking to the exam room for surgery and then back to the waiting room in between Mohs layers). To eliminate this, Newport Beach architect, Jim Bickel and Dr. Rotunda designed rooms for each Mohs patient and a family member to ensure privacy and, if desired, a space to listen to music, watch television, read, work, browse the internet with their laptop, quietly rest, or enjoy coffee, tea, and a snack. We take your comfort seriously. The (at times) several hours of waiting during a Mohs surgery become so much more tolerable when the body is relaxed. After many months of trial, Dr. Rotunda believes he has succeeded in finding the most comfortable patient examination chairs. Our practice’s ultra-soft chairs align with the natural curves of the back and neck and encourage relaxation. 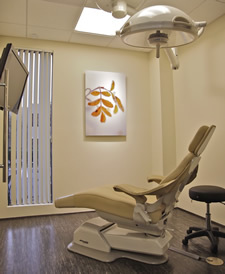 The chairs are unique dental chairs, manufactured by DentalEz. Similar to dentists, Mohs surgeons require easy access to the face, where most of their work is performed. Studies have shown that acoustic environments affect our feelings, productivity, and wellness. After months of research, Dr. Rotunda has partnered with DMX, a distributor of Pandora. Our music is oftentimes upbeat but sometimes serene and relaxing, but certainly you can choose not to have any music in your suite at all. There is significant evidence to show that the traditional medical and surgical setting results in undue patient anxiety. This is not the case in our practice. 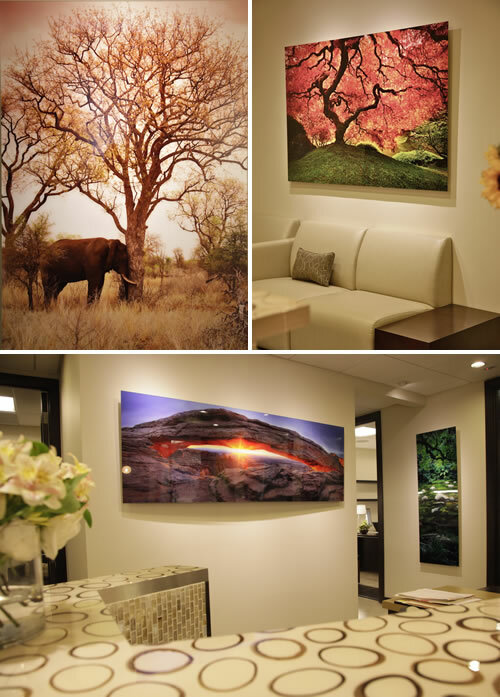 Dr. Rotunda has personally collaborated with internationally acclaimed landscape photographer, Peter Lik, to create a truly extraordinary visual environment. 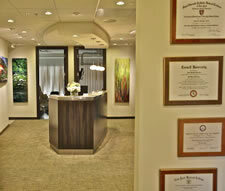 Landscapes of stunning natural beauty are tastefully exhibited throughout Dr. Rotunda’s practice. This partnership has expanded on the novel concept of “Art Therapy” with the belief that patients surrounded by uplifting scenery will become more relaxed and comfortable during their surgical treatment. ©2008-2016 Adam M. Rotunda, MD. All Rights Reserved.